It's almost Valentine's Day, so here is my next to last valentine to share with you. But telling someone you love them has no real holiday time limit....so I'll be making more I Love You cards for sure. This card is sort of an optical illusion. There are four hearts on the INSIDE of this card. The bottom heart layer is the pink patterned paper, the next is green shimmer paper, then a pink and white striped heart and finally a darker pink enamel heart. 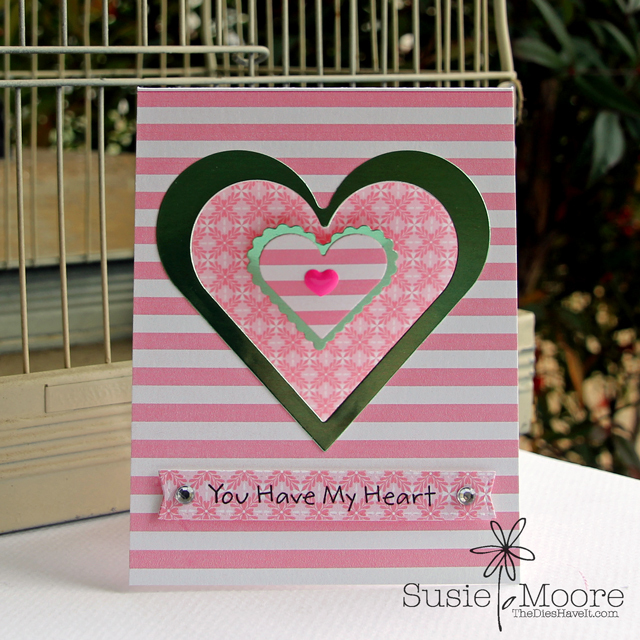 The front of the card is die cut with a larger heart and then I added a green shimmer frame to that cut out. It looks pretty cool in person! I stamped my sentiment onto a die cut banner and then added a little bling. Enjoy your day and I'll be back tomorrow with one final valentine for you.